Wear Cutting Edge Art with Pride – New Shirts Now Available! Step right up and see what wonders we have for you! 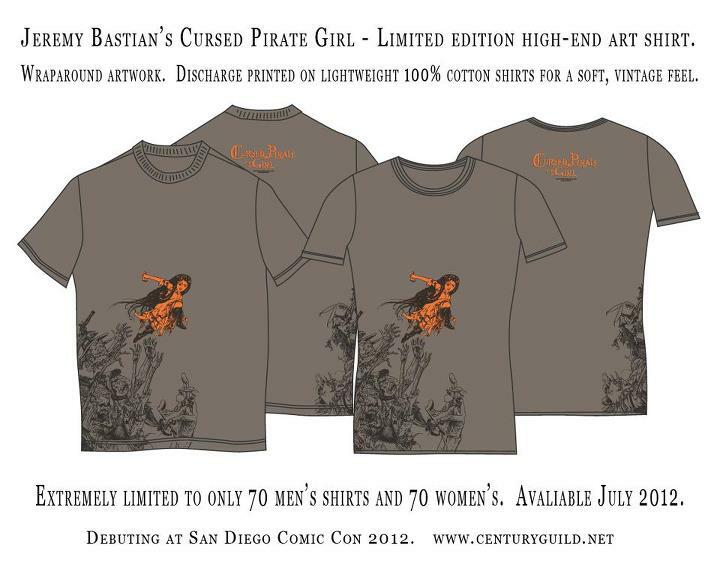 Just in time for the 2012 San Diego Comic-Con, the Century Guild booth (Booth # 2845) is debuting new t-shirts featuring the extraordinary work of Jeremy A. Bastian, the Malleus Rock Art Lab, and Gail Potocki! These new graphic t-shirts, aside from being fashionable and extremely comfortable, showcase the work of diverse and immensely talented artists at the height of their creative apex. Now, why should you buy one (or all) of these very cool shirts? Because they are amazing! Let’s take a closer look at each one and you’ll see why. Available in sizes small, medium, large, and extra large, and produced in a limited edition number of 80, this deep v-neck, fitted t-shirt exclusively for the ladies (sorry, guys) is made of highest quality 100% cotton, features gold foil details, and the graphic was screened using high resolution to create the best possible image. 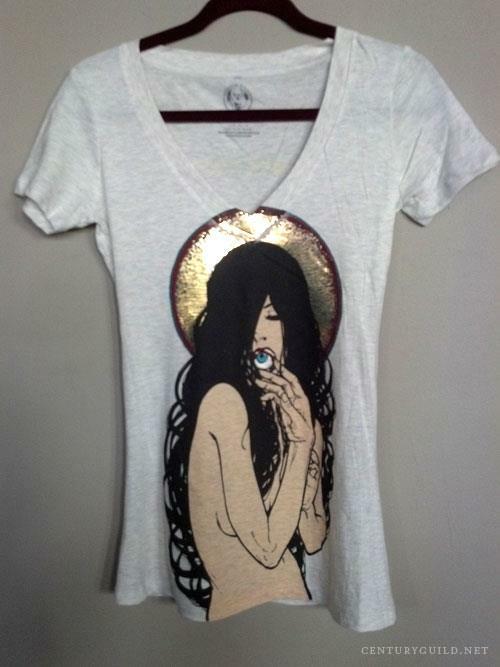 The design appearing on the t-shirt was originally created for a poster to help promote the release of Thomas Negovan‘s historical 2011 debut single “The Divine Eye“, which was recorded on a Thomas Edison phonograph and released as a limited edition wax cylinder. Certainly such a feat is worthy of recognition, and indeed commemoration, but no mere work of commercial art would suffice, so naturally Thomas turned to Malleus Rock Art Lab and what they created is simply spectacular. Malleus is an artist collective comprised of three unique and talented individuals. 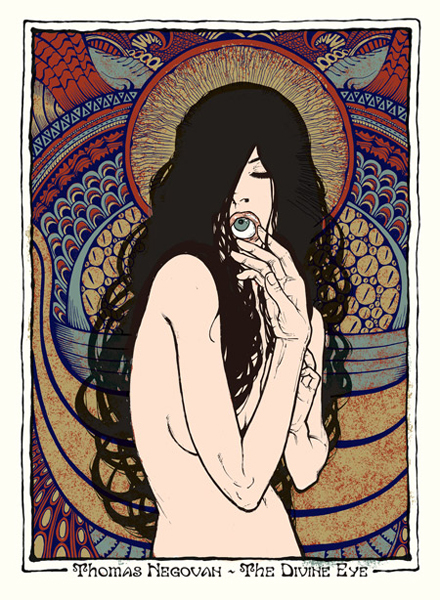 Their work is inspired by Art Nouveau, Expressionism, Surrealism, Psychedelic Art, and Pop Art. They’ve created works for everyone from Queens of the Stone Age and the Mars Volta to The Dresden Dolls and Amanda Palmer. When it comes to creating indelible and iconic imagery to accompany and promote the releases and tours of today’s best music acts, Malleus is already a legend. Also available in BOTH men’s and women’s sizes small, medium, large, and extra large, and produced in a limited edition number of 85 each gender, these ultra-comfortable and timeless, dark grey, crew-neck shirts are made of 100% cotton and screened from high resolution to best capture the masterful work of modern symbolist Gail Potocki‘s brilliant paintings. 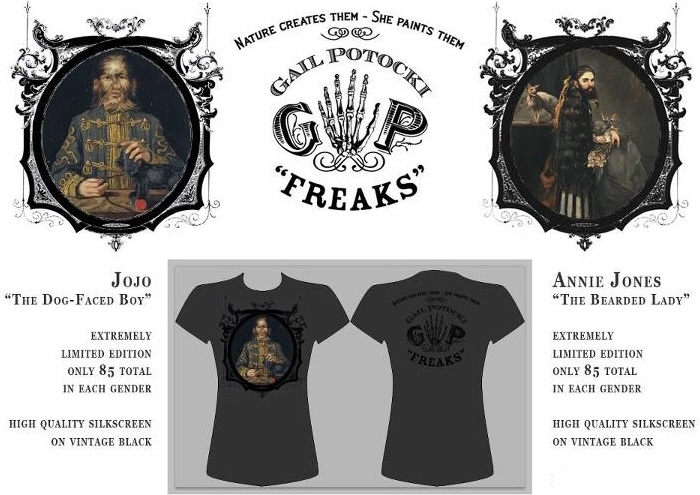 The imagery for these two shirts is derived from Gail’s Freaks series done in 2009, which lovingly pays homage to the world of circus and carnival sideshow figures from the early part of the 20th Century. These detailed and nuanced portraits manage to not only capture the essence of their subjects, but also the imaginations of all those who see them. 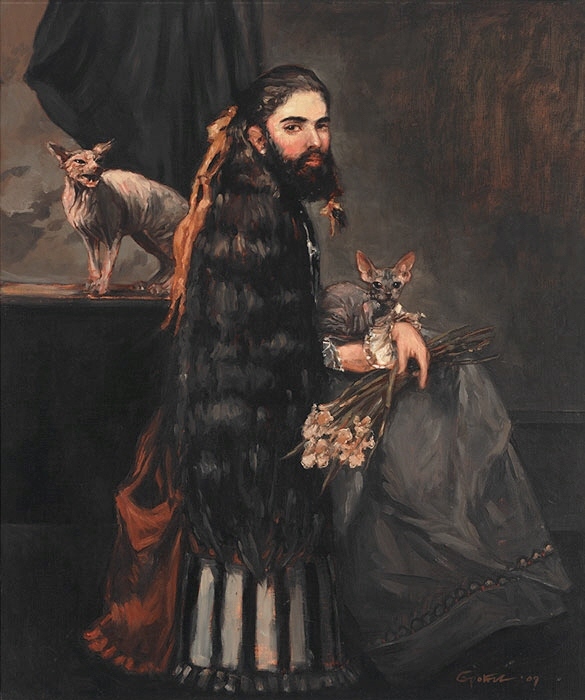 Imagine the look of intrigue on your friends’ faces as you proudly wear your own shirt featuring Annie Jones the Bearded Lady or Jo-Jo the Dog-Faced Boy! So too will the wearers of these awe-inspiring t-shirts, which are sure to become cult favorites and collector’s items, so be sure to pick yours up soon because they will disappear fast! Available in BOTH men’s and women’s sizes small, medium, large, and extra large, and produced in an extremely limited edition number of only 70, these stylish, grey crew-neck t-shirts are made from 100% cotton and feature a slick wrap-around design which was screened from high resolution and allows for the insane amount of detail of Jeremy Bastian‘s work to display itself. 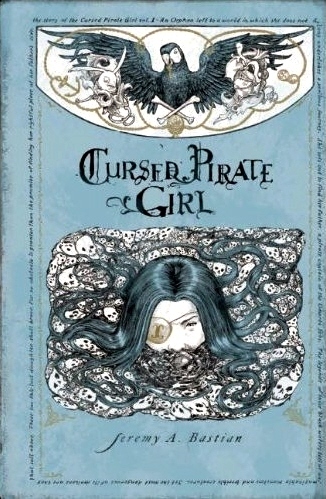 The exclusive design features the Cursed Pirate Girl herself as she heroically leaps out of the reach of the clutches of her vile nemeses. Whether you’re a fan of comic books, pirates, illustration, or just want to wear a really handsome shirt, we have your needs covered thanks to Jeremy’s remarkable work. Jeremy’s astonishingly illustrated and darkly, whimsical comic book for children has been acclaimed by some of the comics industry’s most respected names and the first three epic issues were recently collected in a single volume by Archaia Publishing. 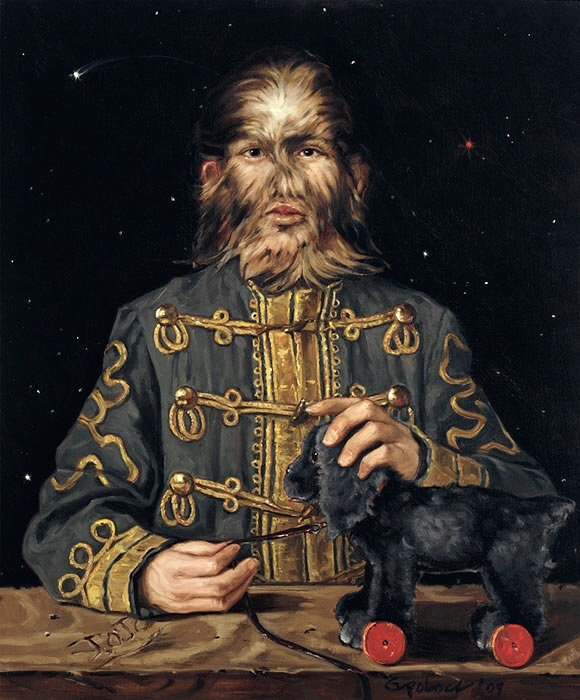 The title has been on the rise in popularity and there’s even a radio-dramedy in the works featuring Stephanie Leonidas (the star of Dave McKean‘s films MirrorMask and the upcoming Luna) as the title heroine and swashbuckling adventurer. Jeremy will be appearing at Comic-Con with Archaia at Booth # 2635 and Stephanie will also be making an appearance at our Comic-Con booth along with some other guest surprises, so keep an eye out, matey! All of these shirts, both in style and sizes, are available in very LIMITED QUANTITIES only at Comic-Con and they will go fast, so you will want to be sure to purchase yours while you can. Stop by Century Guild at Booth # 2845 and pick up yours!